Incertus: I know you're in a hurry, but come on. 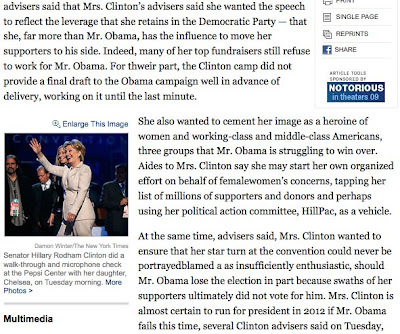 In its rush to get its story on Hillary Clinton's speech out, the NY Times posted a story that was ridiculous in the number of typos it had. Here's a screenshot of part of the second page. The misspellings are bad enough, but the really telling thing is the edits that were made---or more precisely, weren't made--before the story hit the screen. I'll be interested in seeing which words make it to the final cut when this is eventually corrected. Obviously, either the reporter chose one word and someone else chose another, or the reporter put both in and expected someone to make the call--I wasn't there, so I can't know which. But why should there have been a question? Are women's concerns (and what's with that? Issues sure, but concerns?) ever referred to as "female concerns"? Female concerns sounds like a euphemism for a period to me. The second one is even more interesting to me, though. Portrayed versus blamed--there's a universe of difference between those two words, and since it's a paraphrase of what Clinton's advisers said, it's important that the reporter get it right. Again, it'll be interesting to see what winds up being the final choice once this is fixed. What this really "portrays" is just what goes into putting an article together, including important word choices that will affect the way readers respond to the piece. This is a glimpse of the ugly side of it, the side that we rarely get to see if we're not a part of the business end of this work. The cause of this is the rush to get the story out, even if it means the story isn't finished yet. Back in the days when breaking a story first meant you might have sold a few more papers of the morning edition before the competitors got the evening edition out, speed was important. But this isn't breaking news. It's a review of an impressive speech given by Senator Clinton. Was it really important that this story get out this quickly, with all the typos and the undecided word choices left in there for all to see? Hell, the speech only ended a couple of hours ago, if that, and it's mostly junkies like me who are reading about it on the east coast, where it's 12:40 in the morning. It could have waited until the story was clean. But this is part of the problem with the corporate media--fast and cheap is more important than accurate and clean. And sadly, that's not likely to change any time soon. Hat tip to trishb in Shakesville's comments. Update: That was quick. 12:52 Eastern time, and the choices were "women's" and "portrayed." Good call.